Fire crews are continuing to battle “a rapidly developing and aggressive fire” on moorland across Lancashire. Two large fires merged because of strong winds and a major incident was declared because of the proximity of major communication masts. Police told walkers and motorists to stay away from the scene at Winter Hill and Scout Road near Bolton. More than 100 firefighters from around England are tackling the fire, Lancashire Fire service said. 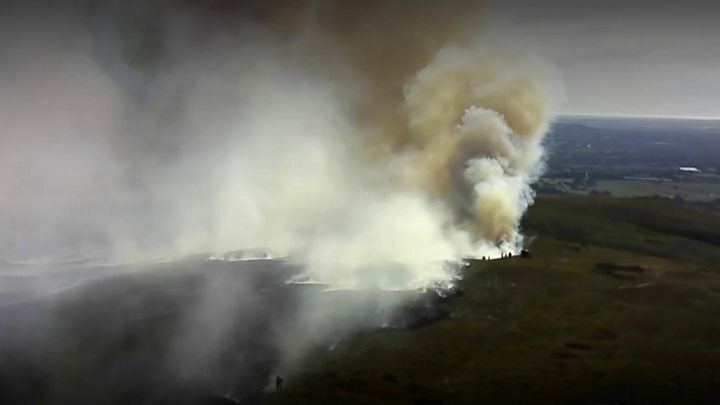 It comes as crews from across the country also joined firefighters and the Army to fight a separate fire at Saddleworth Moor in Greater Manchester, which started a week ago. Along with the Winter Hill and Scout Road blazes, it has blanketed the region in smoke and ash. People in nearby areas have been asked to keep doors and windows closed. The Winter Hill fire, which started on Thursday near a major TV transmitter, is smouldering in pockets across a 3 sq miles (8 sq km) area. A 22-year-old man, from Bolton, was arrested on Friday on suspicion of arson with intent to endanger life. Lancashire Fire and Rescue Service said they were expecting to tackle the fire until Tuesday at the earliest. Assistant chief fire officer Dave Russell said: “Moorland firefighting is very demanding – the firefighters are dealing with undulating terrain, different types of vegetation but also the logistics of deploying resources onto the moorland present us with a number of challenges. “We’re dealing with smouldering fire and flame thumps, which could be 6 to 8 feet. Trenches have been dug to prevent the fire spreading, including one around a house that was evacuated, while a helicopter has been dropping water to help douse the flames. There have been approximately 120 firefighters on the moors over the weekend, split between seven areas of wildfire in Tameside and Winter Hill. About 100 soldiers from the 4th Battalion, Royal Regiment of Scotland, were sent from their Yorkshire barracks on Thursday to aid firefighters in Saddleworth for an initial 48-hour deployment. Their presence has been extended until Monday afternoon following a request by Greater Manchester mayor Andy Burnham. Have you been affected by the moorland fires? If it’s safe to do so, you can share your experience by emailing haveyoursay@bbc.co.uk.